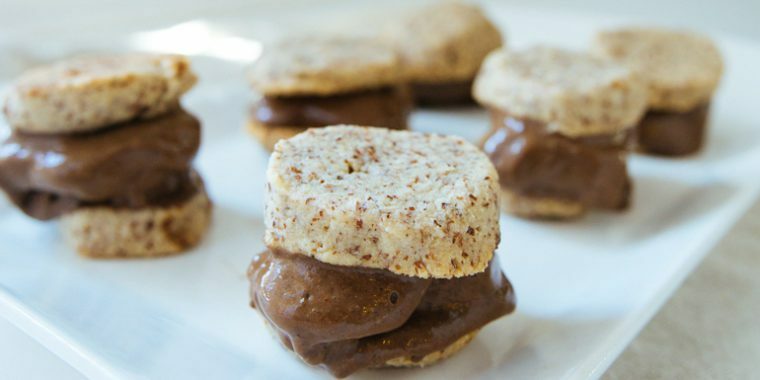 When summer heats up, it’s hard to resist reaching for a cool, summery treat like this Chocolate Peanut Butter Ice Cream Sandwich recipe. The peanut butter ice cream — or “nice cream” if you will — is made from all-natural peanut butter, unsweetened almond milk, and Chocolate Vegan Shakeology (you can use Chocolate Shakeology if you wish, though it will change the nutritional information a little bit). 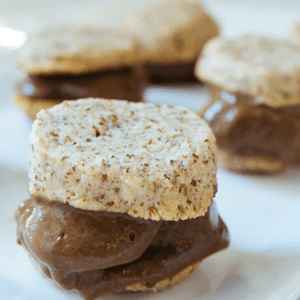 The mini cookies eschew all-purpose flour for almond flour and are sweetened with just 2 tablespoons of maple syrup for the whole batch! Place almond milk, banana, peanut butter, and Shakeology in food processor (or blender). Process until smooth. Freeze until ready to use. Lightly coat large baking sheet with spray. Set aside. Combine almond flour, salt, and baking soda in a medium bowl; mix well. Set aside. Combine maple syrup, oil, and extract in a small bowl; mix well. Add maple syrup mixture to almond flour mixture. Add almond milk; mixing to break up clumps of dough. Form dough into a ball with clean hands. Place on parchment paper. Roll into a 7-inch long log. Freeze for 50 to 60 minutes, or until firm. Cut log into twelve slices. Spread slices out on prepared baking sheet. Bake for 8 to 10 minutes, or until set. Cool for 10 minutes on baking sheet. Loosen with metal spatula, remove from baking sheet and cool completely on a wire rack (or on parchment paper). Place 2 Tbsp. ice cream on one cookie. Top with a second cookie. Repeat with remaining cookies. Freeze for 1 hour; serve immediately.